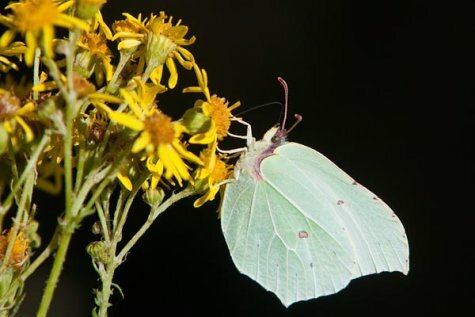 From July on the butter-coloured brimstones of this summer flitter around and the same individuals go into hibernation in the beginning of autumn and delight us in early spring with promises of a „golden summer“. 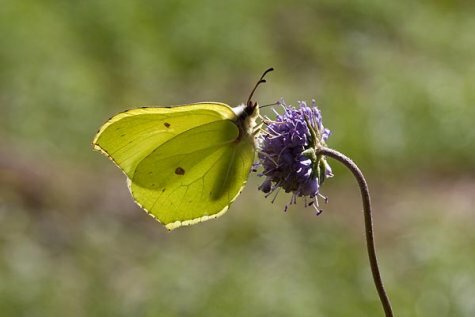 The brimstone butterflies are truly long-lived, an age of up to 13 months has been noted in studies but this is made possible by the “life-style” of the imagos. The butterflies rest in summer. After a few days of active life and feeding they take time off for some days or a week. The life cycle runs with so called diapauses and it is of course influenced by the weather. In the lower photo is a male butterfly, recognisable already in flight from the yellow colour of its wings. The wing colour of the female butterfly is whitish-green. The typical sharp tips of the fore and hind wings, the light wing veins and the reddish-brown patches on the wings show nicely. The female brimstone can be confused with the male of the large white (Pieris brassicae).